The Jews now seem to think they have the moral authority to dictate to the British people who they can and cannot remember on Remembrance Sunday. I really can't wait for the day when these blood sucking alien parasites have been completely removed from our living space. A Jewish woman who attended a Remembrance Day service to mark Anglo-German reconciliation was shocked to discover a wreath had been laid on the grave of a Nazi general. 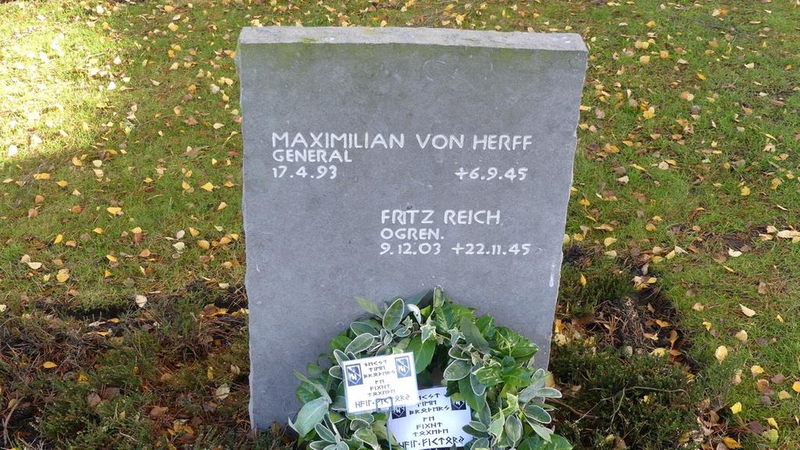 SS General Maximilian von Herff, who is buried at the German War Cemetery, at Cannock Chase, Staffordshire, ran the personal office of Heinrich Himmler, who was head of the SS and a chief architect of the genocide against the Jews. SS General von Herff’s simple grave reveals nothing of his part in the Holocaust but the woman attending the service was “horrified” to discover that the wreath, which had with Nazi symbols, had been placed on it. The symbols represent the Nazi Werwolf resistance, set up in 1944 to establish active forces behind enemy lines as the Allies pushed through Germany. The wreath was also accompanied by text written in Anglo-Saxon runes which contained Nazi slogans. “I was shocked to see it,” said the woman, who wanted to remain anonymous. The text on the wreath reads: "Next time brothers we fight together Hail victory." Karen Pollock, chief executive of the Holocaust Educational Trust said: "It’s sickening that on Remembrance Sunday and shortly after we marked the 80th anniversary of Kristallnacht, an individual or group felt it appropriate to place a wreath on the grave of high-ranking Nazi, Maximilian von Herff - Himmler's chief of staff. The woman, who is of German Jewish heritage, was also shocked to discover another wreath at the cemetery which was decorated in black ribbon and bore the insignia of a group which commemorates the soldiers of an SS division. This wreath was laid alongside many others at the Tomb of the Unknown Soldier. It bore the symbol of the 1st SS Panzer Division, which was linked to war crimes, including the massacre of hundreds of American prisoners of war. “When we pointed it out to organisers later on, I think the wreaths were removed but it is still pretty awful,” she said. Keith Hender, chairman of the Penkridge Ango-German Remembrance Day Association which organised the service, said: "As chairman of the organisers for the last six years, this is the first time I have been informed or indeed seen wreaths of this nature on General von Herff’s grave. 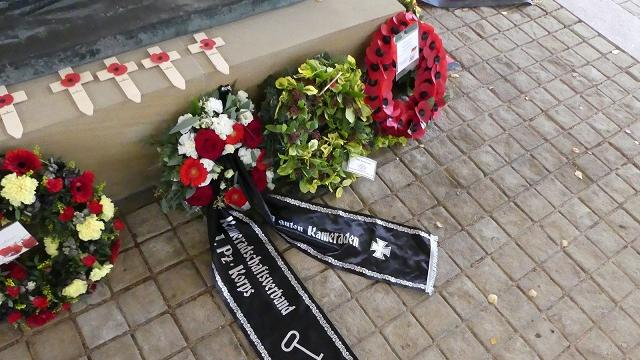 "The wreath from the Panzer Division has been placed on the Tomb of the Unknown Soldier in past years but has always been removed at the earliest opportunity with the knowledge of the German Embassy." Other attendees at the event included German Embassy’s Charge d’Affairs Julia Gross, and the British German Association president Stephen Watson. ... the woman attending the service was “horrified” to discover that the wreath, which had with Nazi symbols, had been placed on it. The text on the wreath reads: "Next time brothers we fight together. Hail victory [sieg heil]." Disgusting! Anybody would think no-one else suffered, died, or lost loved ones during a war that has a total known war-dead of 68 million worldwide. The day of the Jew might soon be over. Yup, I agree, remembering the dead is important regardless which side they fought on...this Jewish woman must be completely mad! Did you not know Jude were the only people in that war that had causalities. Everyone else were drinking bier eating cucumber sandwiches with ham while throwing snarls at the other side. Jewish synagogues and schools be set on fire, their prayer books destroyed, rabbis forbidden to preach, homes burned, and property and money confiscated. They should be shown no mercy or kindness, afforded no legal protection, and "these poisonous envenomed worms" should be drafted into forced labor or expelled for all time. He also seems to advocate their murder, writing "We are at fault in not slaying them". but some suffered more than others. and the ju-ju tribe suffered the mostests. and the germains nazional socialists were reponsibles for mosts of the sufferings, cos they were evils. if i was a member of the ju-ju tribe and saw that graves, i would piss on it. then i'd comes back when it was darks and dance on it. if you likes the words of these raggamuffins from the prehistoric ages, i suggest you converts to islam. they have lots of these words in their mucky books that you can get all exciteds abouts. You can read it all starting here. Due to the allegations in the past, speaking of Jude is off topic at least to myself. What is important is not Jude themselves but those who have followed in their footsteps; these are the CEOs of many companies who have put Jude initiative into practise. Very very clever strategy. Jude are now the puppet masters at least in the interim.